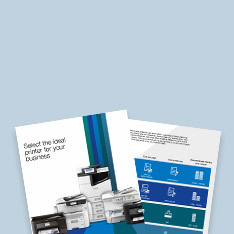 Find the right printer for you. The WorkForce Enterprise business inkjet printer combines ultra-fast performance with low energy consumption. Eliminate traditional printer frustrations and free up your business with the latest WorkForce Pro RIPS business printers. Engineered for business, WorkForce Pro business inkjet printers offer outstanding reliability, reduced environmental impact and reduction in waste. The small but mighty range of WorkForce business inkjet printers bring quality, speed and value to any small office. Enjoy cartridge-free and ultra-low-cost printing with the EcoTank series. 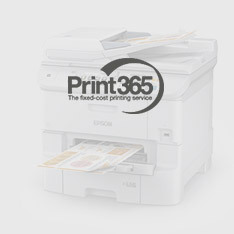 Epson offers ideal solutions for busy home and small offices with superb quality, hassle-free printing at an ultra-low cost. Improve the efficiency of your team with reliable operation and quality results, helping you save money, time and unnecessary hassle to help your small business grow. Keep your productivity up and operating costs to a minimum with fast and powerful technology that’s built to meet business demands. Epson’s feature-packed range of WorkForce business inkjet printers are great for offices with high print quality and volume expectations. Reliable, fast, and built to last, inkjet printers bring quality, speed and value to any small office. 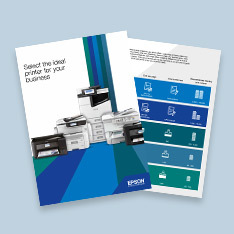 Built for business, Epson’s range of high-performing business inkjet printers increase your overall productivity without sacrificing quality. High speed printing allows you to print large volumes of documents quickly and easily, and the innovative technology simplifies workflows to bring greater efficiency and interactivity to your workplace. Epson’s range of compact, electronic label makers takes care of any professional durable labelling requirements, including filing and asset-tagging in offices, warehouses, factories and more. From pre-press to a range of professional and commercial print products we understand what's important and designed our solutions for your needs. 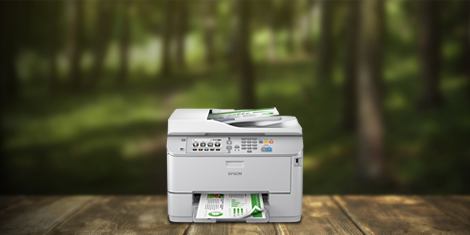 These models complement Epson's range to give greater choice to customers. Ideal for back office, cheque processing and multi-part stationery, for which there is simply no alternative other than impact printing. For more information on Epson business printing solutions, simply fill in your details below and an Epson representative will be in touch.